I'm very excited to announce I'll be joining Dr. John and Charles Neville for "Such a Night" of New Orleans music at the Academy of Music in Northampton MA on February 25th. I've had the great fortune to work with Charles Neville often over the last 12 years and have learned so much from playing and talking with him about music and musicians. I've been a big fan of Dr. John since I saw him perform with Ringo Starr's All Star band in 1989 at one of the first concerts I went to (w/ Ringo, Levon Helm and Jim Keltner on drums!). It's an honor to be playing with these two masters of New Orleans music. This event is a fundraiser for Blues to Green, an organization whose mission is to harness the power of music to bring people together and inspire positive social change, something we could use a lot of right now! It's also happening the weekend before Mardi Gras, so get your friends together, get some tickets and come party it up! New Catfish Blue record "Sky Grows Light" out today! If we've been friends for a long time or if you hung out at La Cocina in Pittsfield MA a lot in 1997, you probably know about a band called Catfish Blue. We played roughly a million gigs between 1996 and 2003 but parted ways before recording a whole album's worth of material. This past summer we got together for a week in MN and went into the studio to finally lay those songs down. It was a great week of music, inside jokes, basement rehearsals, family + friends, gigs and recording with Sean McPherson Steve McPherson and Todd Stentiford. I'm very excited to share the result, "Sky Grows Light" by Catfish Blue - please check it out! Click here for "Sky Grows Light" and all other things Catfish Blue. "Sky Grows Light" is a brand new record of songs written 15 years ago by a band that doesn't really exist. I'm excited to announce the release of Jojo & The Pinecones "Night & Day" available on itunes and Spotify today. This is a fun jazzy recording for kids that we made in partnership with Lincoln Center Education. Today is the perfect day to listen to some fun jazzy kids music, right? Take your mind off things - check it out and enjoy! Co-produced w/ Ben Gallina, w/ arrangements (& playing) by Nick Consol, Bruce Harris, Dana Lyn, & playing by Conor Meehan& Jared Schonig. Special guests: Jazzy Ash & Tim Kubart & kids from Acme Hall Studios in Brooklyn. Engineered and mixed by william farr & mastered byJonathan Jetter. Not just for kids. We made it for adults, too. Check it out on iTunes & Spotify. Hope it brings you some joy today! Purchase it now on iTunes here. I'm playing the role of "drummer" in the latest Honeyhoney video featuring the hilarious and beloved David "Gruber" Allen! Honeyhoney Summer US Tour 2015: A Retrospective. I'm looking back on this Honeyhoney tour and I'm glad we made these videos cause it's all a blur at this point. Weeks on the road? 12. Show's played? 45. Bison seen? 1. Visits to Denver? 3. Denver Omelets? At least 30. Miles driven? About 1.3 million by my estimate. It was crazy and a lot of fun. If you missed it, no worries: We're hitting the road again this fall. Check us out! 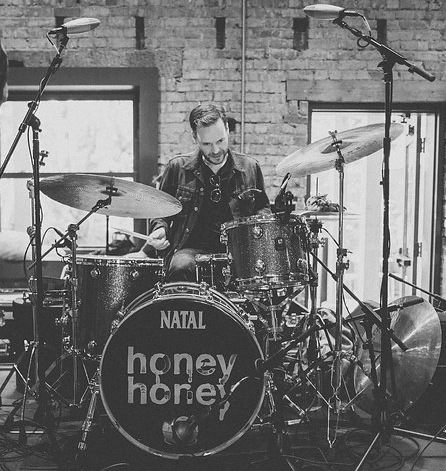 Honeyhoney is releasing a new album in the spring on Rounder Records and will be hitting the road this summer in support, including some summer festivals. Andy Suzuki & the Method will be starting off aboard "The Rock Boat XV" next week, cruising from Miami to Cozumel Mexico with over 40 other bands and a literal boatload of fans. Horizon Bell is a new band off to a good start with a bunch of shows in NYC + some fresh new tunes that we'll be recording in the next couple months. I'll be playing at Birdland and Rockefeller Center with Joelle Lurie this February. I've recently reunited with my western MA homeboy and 7-string guitarist extraordinaire Jason Ennis and along with bassist Michael O'Brien, we've vowed to make 2015 "the year of Trio Jota Sete!" We play a mix of traditional and contemporary Brazilian arrangements, jazz, and Jason's originals, which incorporate a little of each. Looking forward to see where we take it! So many more to mention, but I'll leave it at that for now. Check out where I'm playing and come hear some live music. See you soon!